We’ve gotten lots of great feedback on how to manage office privacy in a cubicle environment. Tomorrow we’ll take a look at how office managers can help improve the quality of the workplace. 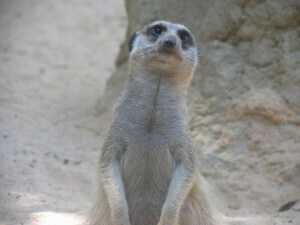 Today, though, lets talk about how to handle the “Office Meerkat”. They are usually obvious – that one worker who can’t keep his or her head down for more than a minute before popping up to scent the air for hints of gossip or excitement. They are so happy to see another friend to chat with – and telling them “Not right now” can feel harsh. However, these jolly folk can completely derail productivity, and should be dealt with. A kind but firm “I’m really in the zone right now – can we chat at lunch?” may have to be repeated a few times before it sinks in – but don’t give up. They can be trained to behave if everyone else is consistent. Does your workplace have an “office meerkat”? What do you do about people popping up in their cubicles every time something happens? Tell us your tricks for deflecting noisy or bored co-workers and keeping these workplace distractions from disrupting your flow. Cubicle Wall Extenders + Etiquette = Happier Office Workers!